British vocalist Martina Topley Bird, best for her work with trip-hop legend Tricky, recently released her third solo effort, Some Place Simple, on Damian Alban’s label Honest Jon. On this album, the artist actually revisits songs from her previous two albums, Quixotic and The Blue God (which was produced by Danger Mouse). The idea to record new versions of some of her songs actually came about after Damon Albarn (Gorillaz frontman) encouraged her to strip the songs naked and get back to the simplicity of vocal melody and drums. “Poison” is a good example of this less-is-more approach: Topley Bird’s gospel-inspired vocals, African drums and tambourine, full stop. The result is a song that is simple and straightforward but also warm and disarmingly honest. As with many other tracks on the album, the subtle arrangements and soulful vocals work like a charm, turning this album into the artist’s most distinctive and imaginative record so far. 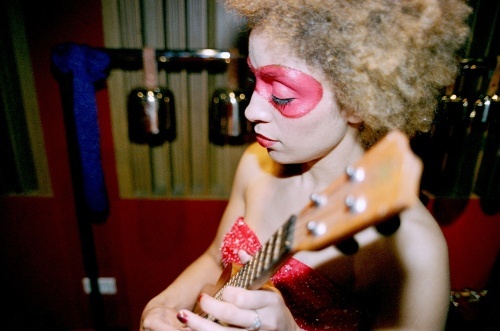 Not content with this wholly stunning reinvention of her previous tracks, Martina Topley Bird also recorded four new songs for the album: “Orchids”, “All Day”, “Kiss kiss kiss” and “Harpsichord Kiss”.